Goal: To consolidate preliminary finds, encourage discussion about the main issues and how these can be solved. 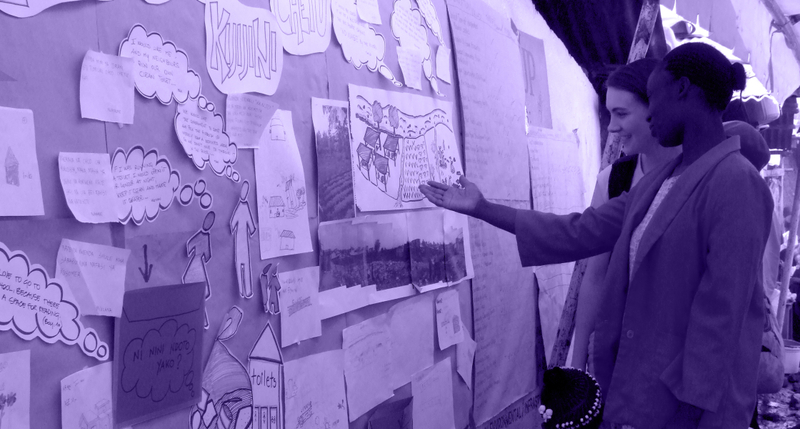 The Dream Wall consists of an interactive street installation containing the preliminary findings, using material gathered during the previous stages (drawing pictures, quotes and maps made by both the participants and the residents). Envelopes are also available where people can write their thoughts and ideas and, remaining anonymous with only their age and gender. The interaction between the residents and the wall should always be facilitated by the coordinators of the activity to encourage discussions and elicit further about residents’ thoughts and dreams about their neighbourgood. At the end of the day, the enveolopes and notes on discussions are collected and the information is analysed and used to triangulate with findings from tools used prior. Step 1: Information is translated from tools used previously. Step 2: Information is pinned up onto the ‘Dream Wall’ and labels, pencils and envelopes are left out for participants’ use. Step 3: Facilitators are at hand to help elaborate on the information presented on the ‘Dream Wall’, and encourge discussion into the issues and ideas expressed. Step 4: Notes should be taken during the discussion but should be pinned onto the wall along with other information. Step 5: Opinions of residents should be anonamously placed in envelopes along with their age and gender. Step 6: The ‘Dream Wall’ should be dissembled and information should be collected and triangulated with information sourced from the tools used prior. Notes for facilitators: Everything should be translated to the local language in order to make the information accessible to the whole community.